They call it “conspiracy theory” as an excuse not to listen to what the people are trying to tell them. We draw closer to another imperialist war and as the global economy creaks beneath our feet, red-baiting is again back in fashion. 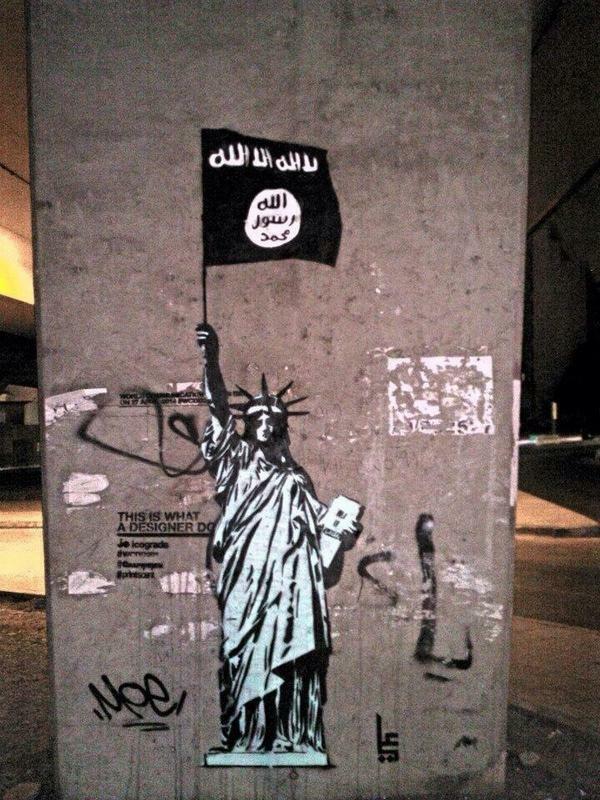 We are to believe there is no choice between ISIS and Obama. There is no choice between abject poverty and crushing student loans. No choice between the burka and the bikini. In a culture where choice is worshipped as part of holy agency, holy self-value and atomization, the choices presented to us are rather bare bones – we will have neoliberalism or we will have death. “There is no alternative.” And don’t speak, don’t even think, about seizing the means of production. In the clip above, released by the US State Department, we have a strange comparison. On the left, we have communism, and on the right, ISIS. The title is “Destruction of Holy Sites”. At first blush, this might seem rather nonsensical. The two historical and geographic contexts presented to us in the video are completely different. Did the United States and its allies fund communism, for one? But then to examine the context of the propaganda: does communism have a strong history or a foothold in the Arab world? Well, the answer here is yes. Red groups and red money has shaped much of the policies of the region. Today, red groups are making some of the strongest gains against the rag-tag lot of foreign takfiris styling themselves after the sahaba who also call themselves Dawlat Islameeya, the Islamic State. These revolutionaries don’t accept the idea that the barbarity seen mounted on the spikes of the Raqqa’s city centre is homegrown, a natural conclusion to the horrific chapter of American occupation. They don’t accept the idea that this is a tribal spat, an ethnic power struggle. No, they see it as part of class war, as foreign imperialism making a play. And so a false equivalency is generated to guide those who would otherwise gravitate towards pointing the finger (rightly) at American and Zionist designs on the region, away from a politics of liberation and towards capitalist enclosure. I’m a red. The people dearest to me in this life are reds. I have immense respect for Mao Tse-Tung, who liberated the Chinese people not only from imperialism, but also from poverty. Maoism inspired millions of people worldwide to struggle towards their own liberation. And I don’t recall Maoists in China kidnapping women and putting heads on spikes, but perhaps this is a part of the story Maz might not want to discuss. Regardless, back to the context – really? 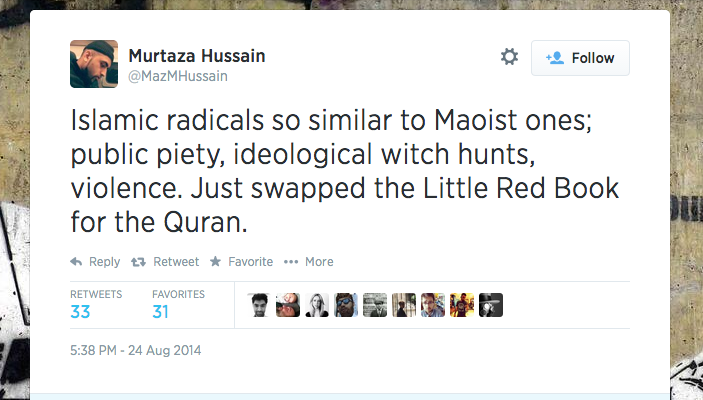 Are reds in a position of power as ISIS is? Can we fairly compare the two? Or is this is a smear against reds in the same tradition as the US State Department video mentioned earlier. Likewise in Ferguson, Missouri, where we again find the horrified whisper regarding “outside agitators”, a civil rights-era slur against those who struggled for the liberation of oppressed nations in the United States. Now, to be fair and give credit where credit is due, the civil rights movement was certainly supported by communists in the United States and abroad. More importantly, it would be a tragedy and crime to erase incredible leaders such as A. Philip Randolph, Paul Robeson, Bayard Rustin, Angela Davis and most of the Black Panther Party for Self Defense – all reds. But where are they now? Is the RCP secretly getting paid by a Soviet Union that no longer exists? Back to the context! While this smear of “outside agitators” was used against the civil rights movements as a dog whistle for communists, and as it is used today for reds and anarchists, it’s also an exercise in mystification, in red-baiting and in smearing the ideology of socialism as something ‘foreign’ to the people. Stalinist (or Baathist) is just another term used to defame reds – mainly those who are against imperialist war in Syria. Even as Libya writhes in agony after a NATO war that left the African country with the highest HDI and best public infrastructure in smoldering ruin, to suggest you are against such further aggression will earn you the title of ‘Stalinist.’ And again, to give credit where credit is due, the USSR under Stalin did annihilate the Nazis and liberate most of Europe. But to be called a Stalinist (or even Baathist) by someone who is most certainly not a red is to be smeared, and is unambiguously used to discipline other reds and pinks to shy away from speaking out against NATO intervention in Syria for fear of being a secret Stalinist, whatever that word even means outside Cold War hysterics. All of these things aside, why now? Why the recent spike in red-baiting? From Arabic-language State Department videos comparing ISIS to communists to VICE “journalists” denouncing Stalin like they’re lifelong members of the fourth international, there seems to be a resurgence on the periphery of some sort of – and I can only call it preventative – red scare. The language of being a red is gone – now you are either a radical or a barbaric Stalinist. Radicals can shill for bombing Libya, radicals can produce ‘ironic’ racist burlesque minstrel shows, radicals represent the underclass and everyone who disagrees with them are now comparable to mercenaries who crucify people (including reds) in public squares in Syria. So what danger on the horizon, then, from reds? The disciplining is remarkable – Steve Salaita is fired from a tenured position over his views on Gaza, and an unknown but certainly existing number of academics switch off their profiles, put everything to private. Reds are doxed – their address, their phone numbers, their emails, their boss’s info are posted to the internet along with their designation as DANGEROUS COMMUNISTS and they suddenly disappear. Public campaigns from neocons against leftist magazines that publish anti-imperialist articles. Visits from FBI agents with dossiers triggered by what exactly – maybe it was a tweet? Julian Assange locked in the Ecuadorian Embassy for how many years now? Chelsea Manning in solitary confinement. No wonder people go under pseudonyms – the environment is once again getting dangerous for those who don’t think imperialism or capitalism is such a hot idea. Consider that much of this red-baiting is in response to a growing, powerful war hysteria. It’s undeniable – a comrade of mine in the states observed it’s worse than the rhetoric in 2002. Ukraine must be protected from Putin’s hordes, Syria must be protected from tyrant Assad, and Iraq must be protected from themselves and their barbarian savages. The drums are beating louder and louder, while the working class of the world stands war weary and exploited to the extreme. The most powerful challenge to capitalism in the history of the world emerged out of the first World War. Impoverished millions sent to die on the front line, and while it may not be our boys off to fight in the trenches this time, a world war that echoes the motivations and methods of 1914 will cause damage and pain such as we’ve never seen. In a global economy where billions are underserved, unemployed or barely working, this war can only be won under a red banner. Indeed, now more than ever, the spectre of working class revolution strikes terror into the hearts of the barricaded ruling class. This is why they persist in their handwringing about Stalinists and Maoists – because the moment of truth is approaching once again, and both Stalin and Mao have never been friends of global capitalist hegemony. A revolution that seizes the means of production is not something that is built overnight, as history teaches us, but we need to start on the foundations of such a project as soon as possible. Their anxiety is a cue for us to intensify in our efforts. This is why they are resurrecting red-baiting, why they are looking nervously over their shoulders for the communist menace to arise. This is why it’s worth it for them to try and entrap the youth on a micro-level, atomize us further, discombobulate our senses and teach us not to trust what is real and what we know to be true in a material sense. Capitalism has produced its own grave diggers, and they are handed a shovel while being told to go support yet another imperialist war.